Think you’re ready to start a gym franchise but feeling overwhelmed about where to begin? Don’t worry, we are here to help! In this comprehensive guide, we’re going to walk you through the important first steps to successfully start your own gym franchise. This guide will give you the confidence and tools you need to take the fitness franchise industry by storm. After all, now is the perfect time to do so. You know the old saying- if you do what you love you’ll never work a day in your life. Well there is a reason this saying is so commonplace. Aligning your passions with your career is important to ensure you are continually motivated and fulfilled. That being said if you are passionate about business and/or fitness then opening a fitness franchise could be the perfect opportunity for you to leverage your passions in an impactful way. If you work towards something you genuinely care about, this will show through your work and you will flourish! So before beginning the journey to start a gym franchise, think about how this opportunity aligns with your passions. Whether it be helping other people feel good about themselves through fitness or the indoor cycling community in itself, identifying your passion will allow you to persevere through the ups and downs of your career. Everything has a price, and opening a gym franchise is no different. Taking time to make sure you understand the costs associated with starting a gym franchise upfront will save you trouble down the line. While opening a full-size gym can cost anywhere between $500,000 and $2.5 million, opening a boutique studio (such as an indoor cycling studio like Rush Cycle) typically costs less and ranges between $350,000 to $400,000. Keep in mind though that the actual cost of this initial investment will largely depend on the type and size of space you are able to find, as well as the equipment required to run your studio. Although getting a startup loan is difficult with no revenue, there are other options to help you finance your franchise. Crowdfunding and borrowing money from friends and family are common ways people finance a new small business. If that’s not feasible you can also look into getting a government-backed loan through The U.S. Small Business Administration or working with a nonprofit lender. Whatever you decide, keep in mind that since your business isn’t making any revenue yet, your personal finances will be used to determine if you are qualified for startup financing. If you are franchising with a known brand, you will also need to factor in royalty costs. These royalties will provide you with continued use of the brand name and entities, which is a major draw for those potential customers that are already familiar with the brand. The company should also assist with the marketing, advertising, the training of new employees, and provide other support that you wouldn’t normally receive if you were to go at it alone. Be sure you fully understand the franchise agreement and royalty fees of the company you are interested in partnering with so you can calculate these into your costs accordingly. Some brands charge a flat rate per month while others will take a percentage of your gross revenue. When thinking through where to open your fitness center, be sure you take into account the wants and needs of your target market. Your location should be easily accessible to your consumers and should have plenty of parking. Urban areas tend to perform the strongest since most gym-goers will pay more for a gym facility that is close to home or work. Will the neighboring businesses bring in additional foot traffic? Do the neighboring businesses offerings complimentary products/ services to your businesses? Are there competing businesses in the area? All of this information should help you determine whether the location you have your eye on is going to contribute to the long term growth of your franchise. To buy or lease, that is the question! Depending on the company you choose to work with, this might not be a decision you have to make. Either way, you will have to make sure your equipment is on the cutting edge. Technology is becoming more and more prevalent in workout equipment, and your members will want the latest and best machines and equipment to use. It’s important to take into account the cost of equipment as well as maintenance and updates in your costs. Of course, you will need to hire employees in order to make your new fitness center run. This will be your biggest expense after your rent, but also your greatest asset as you grow your business. Depending on the company your partner with, as a franchise, you may be provided guidelines for hiring trainers, instructors, and other staff members. Many franchises will offer staff training as part of your deal as well, and they will likely have regional staff to help you get off the ground running or fill-in should you have any staffing gaps. You will likely have a mix of full-time, part-time, and contractor staff members, but it’s important to give all careful attention when making your hires. You need to create a professional, friendly, and supportive team who will make your health club a fun place to work, as well as an ideal space to work out. It’s also in your best interest to give special attention to who you hire for to your sales team and positions that interact with customers, as each will play large roles in the success of your franchise business. The fitness industry is unique in that although it offers stability via recurring monthly income from those with a membership, it also experiences seasonality ebbs and flows depending on the season. When you are in a low period, you can learn who your core membership is, and what your base rate of income will be throughout the year. This base rate is the number you will make your projections based off of. And remember, these core year-round members are the ones you need to keep happy to ensure your success, so be sure to nurture them properly. It’s also worth noting that historically, the fitness industry has continued to grow even in the face of economic downturns- now that’s a recession-proof investment. A large factor in the success of franchises, regardless of their size, is making connections with and between their consumers. People want to feel like they are part of a community, and if you can create an environment where people feel connected to those around them they will continue to come back for more. Studios that maintain a consistent schedule will begin to recognize the faces of those who often attend at the same time. Be sure you and your employees make an effort to build relationships with your members, whether it be in the studio (partner class anyone?) or outside of the studio, at, for example, a company-sponsored smoothie bar. You want to create a community that will push and motivate each other to keep working towards their fitness goals. Gyms with excellent customer services and a friendly team will provide the best atmosphere for such connections. You’ll maintain your core membership and start to grow it by referrals, which is the most powerful form of marketing for fitness studios (besides a free trial class of course). Moral of the story is build those relationships with your members and ask for their input and feedback. They will notice you are paying attention and are being proactive in making them happy, and they will appreciate you for it. Take a second to reflect on everything you’ve just accomplished and take pride in the fact that you are now an official business owner! Enjoy the fruits of your labor by taking some of your own classes and engaging with the community you’ve created. Connect with other franchise owners to gain and share valuable insight based on your own experience. Keep hustling and working hard and who knows, maybe there will be more franchise opportunities in your future. Rush Cycle is one of the fastest growing fitness franchises in the country with 20+ established locations across the nation and more on the horizon. Rush Cycle provides indoor cycling group fitness classes developed to increase your heart rate, boost your metabolism, and inspire you to create positive change- oh and did I mention they are fun!? Rush Cycle offers detailed guidance and support throughout the entire franchise process to ensure you are set up for success. 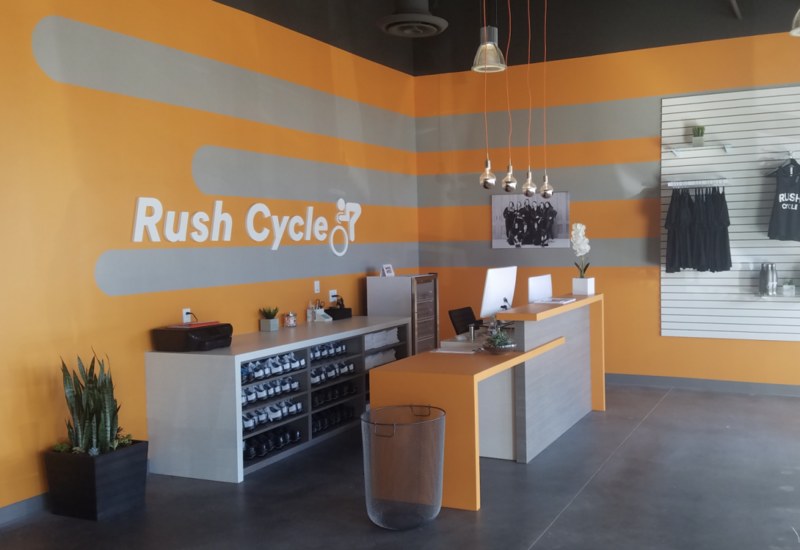 If you are interested in learning more about starting Rush Cycle gym franchise in your area, fill out the Rush Cycle Franchise Request form to get in touch with a Rush Cycle representative today.